Most rental contracts say the house or the flat must be returned in the same condition it was let out with a clause allowing for ‘fair wear and tear’. It is often open to interpretation to prove the fair wear and tear or indeed to prove the opposite. Most good landlords expect their property returned in a professionally clean and undamaged condition, but who understand that it has been lived in for a year or more. Others will expect the impossible from the tenants, seemingly expecting them to be living in a house without ever actually touching anything. Even worse, some landlords appear to forget that their carpet was already dirty with stains everywhere when tenants moved in and will try to spend their whole deposit on re-carpeting the flat, perhaps with something left aside for a new microwave or a fridge! So if you think you’re being unfairly charged, to regain your money, you will need to ensure that you return the house in the best state possible, and just in case, prepare some evidence. Be careful when moving. You may have looked after the property impeccably but the biggest threat to your deposit comes when moving in and out! Make sure your man and van don’t knock doorways with heavy furniture and be extra careful when moving all the boxes and bags especially if there are liquids in it. Choose a man with a van company which is professional and with very good testimonials feedback. Search “professional end of tenancy cleaning London” in Google. Check a couple of companies for their end of tenancy cleaning service and ask how they do it, what equipment do they use and how much do they charge. Pick up the one which seems to be professional and the price is not the cheapest, otherwise you will get what you pay for. 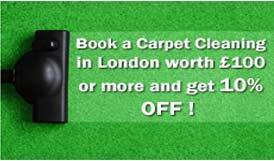 Ask the cleaning company you choose whether they offer professional carpet cleaning service as well and if they do ask them what equipment they use and what guarantee of the quality of their service you can get. Ask for the price. Explain what condition the carpets are in and ask if they think the carpets will be looking better at the end of the service. Most cleaning companies do clean the windows inside and out ( if ground floor) as part of their end of tenancy cleaning service, so check if they have done it properly. If it is not a ground floor, arrange window cleaners to come and do it from the outside. If the walls are stained, either touch it up yourself or call a painter and decorator for whom it will be a pleasure to do it for you. Check that all lights in the flat have working bulbs. This is a small expense and reflects well on your general maintenance of the property. The camera is your strongest weapon. When the cleaners leave, photograph each room in detail to show the beautiful condition you have left the house in. If you do need to dispute charges, you will need photographic evidence. Some advice suggests that you should also take labeled and dated photos, including any faults, when you arrived and send copies to the landlord alongside the inventory. Both parties will be invited to submit all their evidence in one go, before the adjudicator ruled. Luckily, if the estate agent had forgotten to take an inventory in the first place you will win all your money back by default, but in more nuanced cases, you may still be able to claw at least some of your deposit back, provided you can back your claims up with evidence.